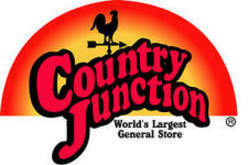 Enjoy a great meal at Country Junction, The World's Largest General Store. Country Junction's Barn Door Restaurant has delicious pizza, Italian favorites, burgers, sandwiches, wraps, salads, fries and more. The ice cream parlor will satisfy your sweet tooth with sundaes, milkshakes, flurries and famous butter beer floats along with BBQ, hot dogs, soup, mac-n-cheese, soft pretzels and more. Visit the store to sample homemade fudge, peanut butter, roasted peanuts, dips and jellies. Stroll through the bakery for fresh pastries and pies, and stop by Sorrenti's wine cellar for local wine and tastings on weekends.